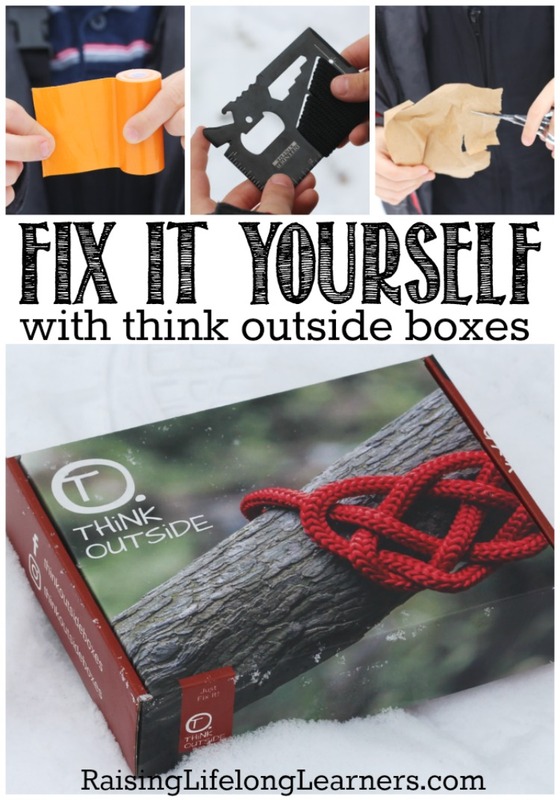 This month’s Think Outside Boxes Repair Box might just be the best one yet. I keep saying that, but I’m not sure how this can be topped. Complete with a sewing kit, duct tape, paracord, resource cards, scissors, and a multi-tool, my kids are learning to be self-sufficient and to take care of their things better than they ever have before. My kiddos, like many out there, tend to think that if something breaks they should throw it away. A toy’s arm breaks off and they want a new one. Pants rip at the knees, and they never want to wear them again. This month’s box is teaching them differently. What happens if you’re out on the trail and your pants rip at the seat seam? Will you take them off and throw them away? Of course not. You’re stuck with those until you get off-trail and back to your house. But, if you’re in the habit of repairing ripped and broken things, you’ll have your sewing kit to pull out and fix that seam right there. Too big a tear to fix quickly? Duct tape is a quick fix, and then when you get home you can patch it. 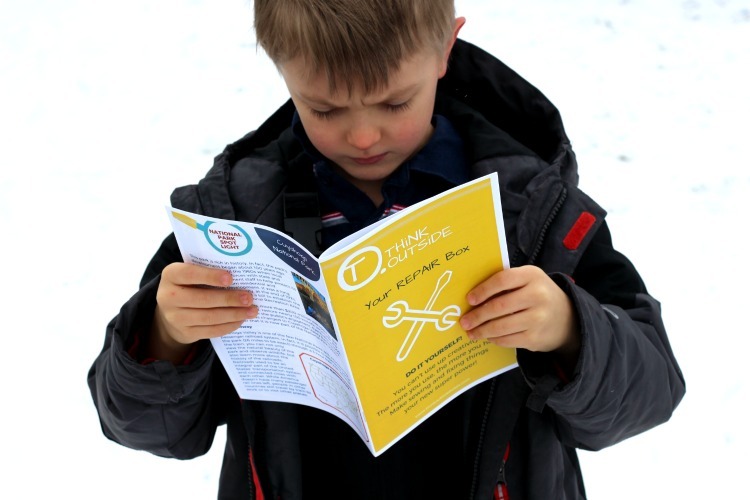 In the workbook that comes along with this box, kids learn basic sewing skills suitable for mending clothes, bags, or outdoor gear. They also learn how to sew buttons — a valuable skill! My favorite project, though, was making a drawstring bag out of an old t-shirt. It was simple and so much fun. The kids have plans to make more bags to store all the things. Nothing can top an amazing multi-tool for a teenage boy, though, and that was my oldest’s favorite part of the box. I’ll admit, it IS pretty cool. 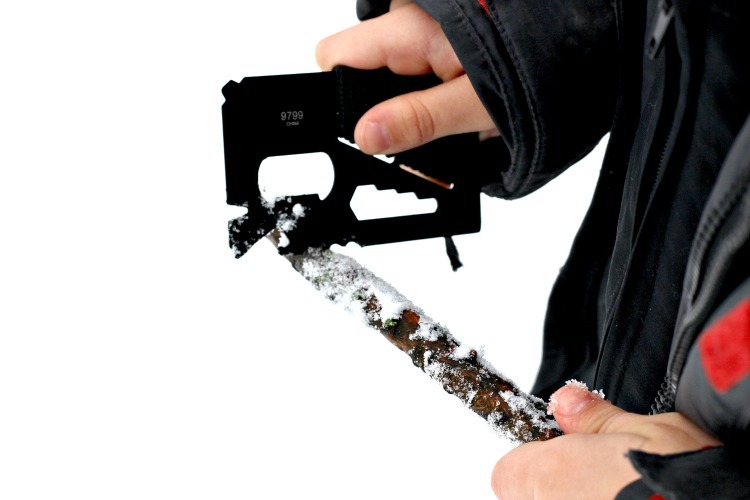 This one is credit card sized and includes rulers, a can opener, bottle opener, knife, rope, wrench, wire strippers, screwdrivers, twine cutter, and a butterfly wrench. The youngest two in the house — nine and six — loved the idea of making a tripod and forming a shelter out of it. We’re planning to search out some similarly-sized sticks to do that when the weather warms up a bit. The best part of the entire box — and workbook — for us was that the featured national park was our very own Cuyahoga National Park. We love hiking there, and so it was fun to see it in the workbook. Have you gotten your subscription yet? Don’t forget that Think Outside Boxes has a $10 off offer for Raising Lifelong Learners reaaders if you use the code RLL10 when you check out on their site.